Dane’s Dyke : Jutting out miles into the North Sea, the headland has in the past been effectively cut off by the construction, in the Iron Age, of the erroneously named Danes’ Dyke, which encloses five square miles of the peninsula. The end of the Dyke is a deep ravine on the south side of the Headland, where it exits into Bridlington Bay (the photograph at left shows the beach at the end of the Dyke). 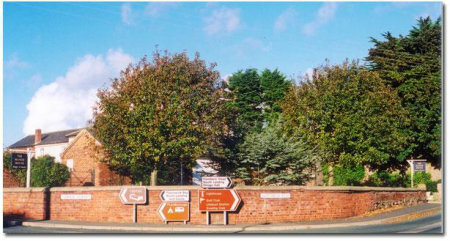 There are a number of nature trails in the Dyke which can be accessed easily from the car park off the main Bridlington to Flamborough Road. Although visible across the entire headland, the Dyke is not such a prominent feature as it approaches the northern side and, seaward of Bempton Cliffs, is barely noticeable. An Edwardian postcard showing the village from Croft's Hill. 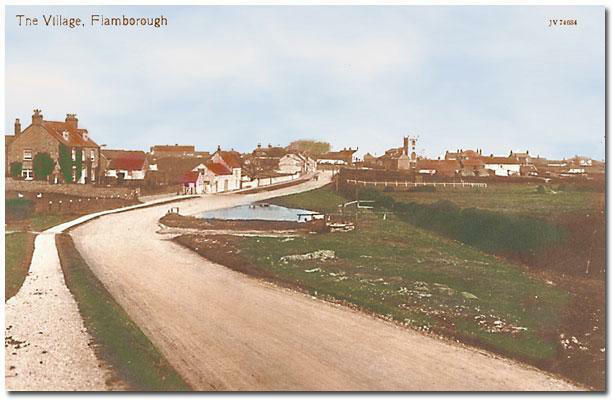 Shown below are various postcards of Flamborough, generally dating from the period 1900 to 1914. 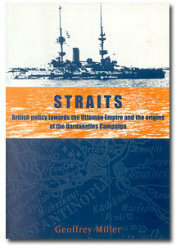 The postcards were originally printed in black and white, but have been coloured and enhanced. Many of the views shown have changed little to this day. 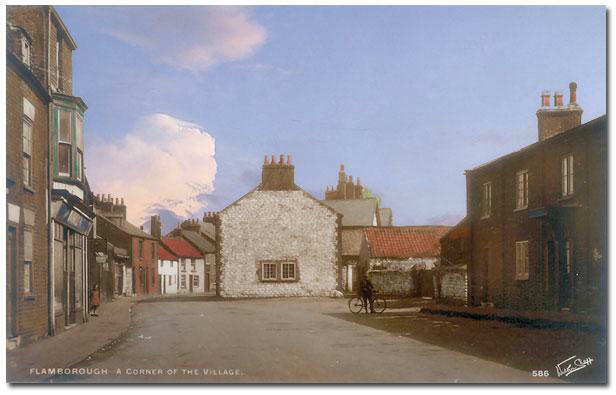 The village High Street again has changed little over time, apart from the absence of cars. 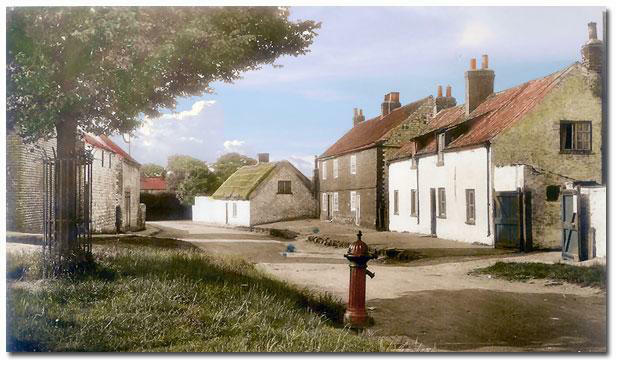 The view down West Street: the cottage in the centre still exists, though it has lost its thatched roof. The tree was only felled in recent years when it became unsafe. 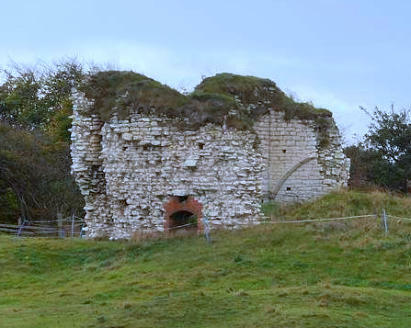 The remains of "Flamborough Castle". Again, the pond has now disappeared. Another Edwardian postcard showing the village from Croft's Hill. An Edwardian postcard, showing Tower Street, looking towards the Manor House. 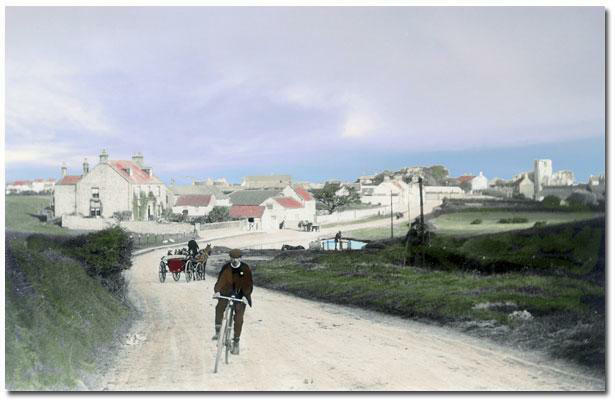 The Seabirds Bar & Restaurant on the right still exists (and is recommended); however, the cottage in the left foreground was demolished to allow for road widening. A later view showing the old Post Office at left and Newsagents at right (which now functions as the village Post Office). In 1870-72, John Marius Wilson's Imperial Gazetteer of England and Wales described Flamborough thus: FLAMBOROUGH, a village and a parish in Bridlington district, E. R. Yorkshire. 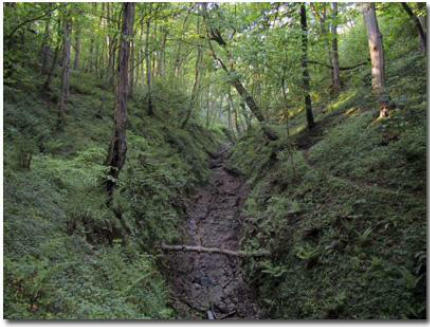 The village stands in a hollow, near the centre of a promontory, 2 miles E of Marton railway station, and 4 NE by E of Bridlington. It was known to the Saxons as Fleamburg, signifying "light town;" and it is supposed to have derived its name either from a flame-tower or beacon erected near it at some early period, or from the Continental town of Flansburg, belonging to the Jutes. It evidently is a place of much antiquity; it is even supposed to have been an important Roman station; and it probably continued to be somewhat notable in the middle ages; but it is now little if anything more than an ordinary fishing village, and coast-guard station. It has a post office under Hull, a church, two dissenting chapels, and some remains of an ancient tower. The church is ancient; consists of nave, aisles, and chancel, with small western turret; was partially restored in 1865; and contains a carved screen, an ancient font, and an old brass. The remains of the ancient tower are at the west end of the village, and bear the name of the Danish tower; but no record exists to throw light upon its history. The parish comprises 2, 980 acres of land, and 598 of water. Real property, £4, 773. Pop., 1, 287. Houses, 306. The property is subdivided. 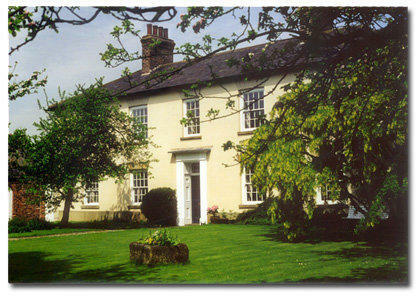 The manor belonged to King Harold; was given, after the Conquest, to William le Gros; and passed to the Constables. Flamborough Head terminates the promontory, at about 2 miles from the village; consists of chalk cliffs, rising to the height of from 300 to 450 feet; is the resort of many myriads of sea-fowl; and has been pierced, by the action of waves and weather, into numerous caverns, the more remarkable of which are called Kirkhole, the Dovecot, and Robin Lyth's hole. Only two landing places, and these not good, are on the promontory; yet Ida the Saxon landed here with forty ships, to fight for the crown of Northumbria. A lighthouse, built in 1806, stands about 400 yards from the extreme point of the promontory, at an elevation of 250 feet; is a neat circular structure, 82 feet high; and shows three revolving faces, each of seven reflectors, one painted red, -the revolutions being so timed as to distinguish this light from any other. The living is a vicarage in the diocese of York. Value, £130. Patron, W. Strickland, Esq. See Danes Dyke, and Bridlington. Flamborough is a village and civil parish in the East Riding of Yorkshire, England. 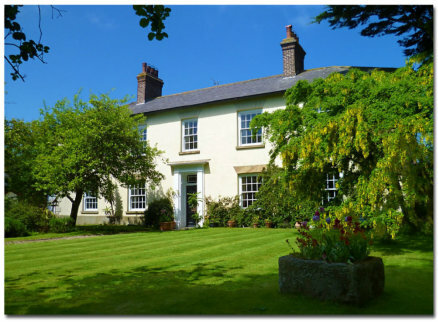 It is situated approximately 4 miles (6 km) north- east of Bridlington town centre on the prominent coastal feature of Flamborough Head. The most prominent man-made feature of the area is Flamborough lighthouse. The headland extends into the North Sea by approximately 6 miles (10 km). To the north, the chalk cliffs stand at up to 400 feet (120 m) high. According to the 2011 UK Census, Flamborough parish had a population of 2,161, an increase on the 2001 UK Census figure of 2,121. 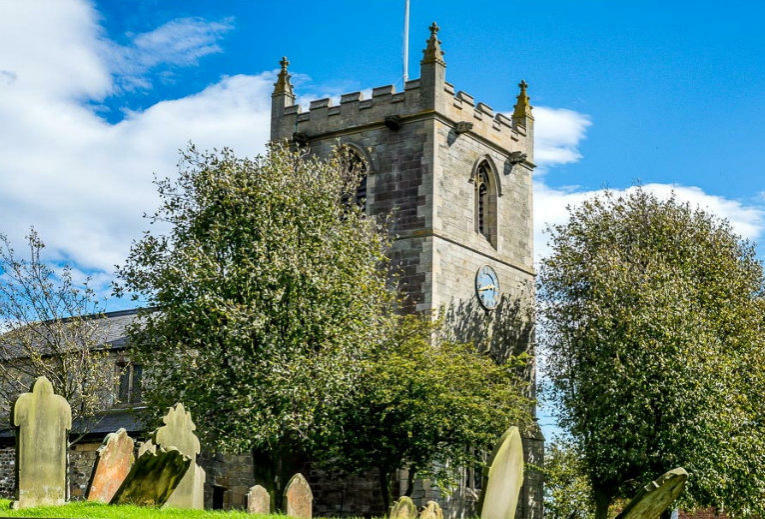 The church of St Oswald stands in the village and was designated in 1966 by English Heritage as a Grade II* listed building. 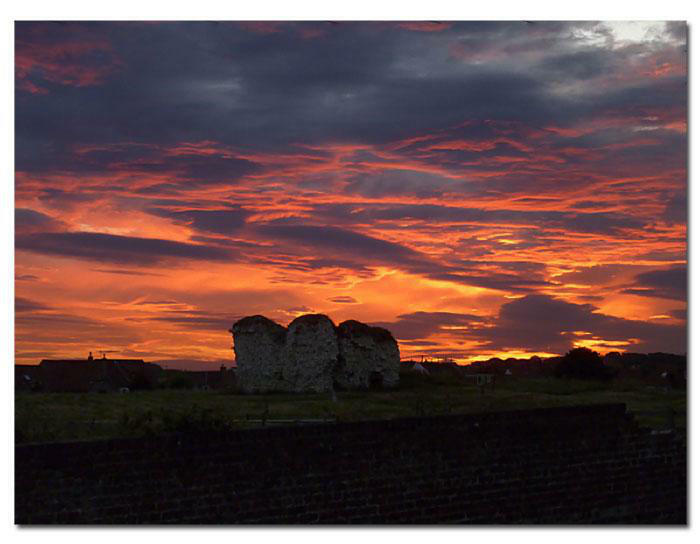 In the village are the fragmentary remains of Flamborough Castle, a medieval fortified manor house. In 1823 the village was a parish in the Wapentake of Dickering. 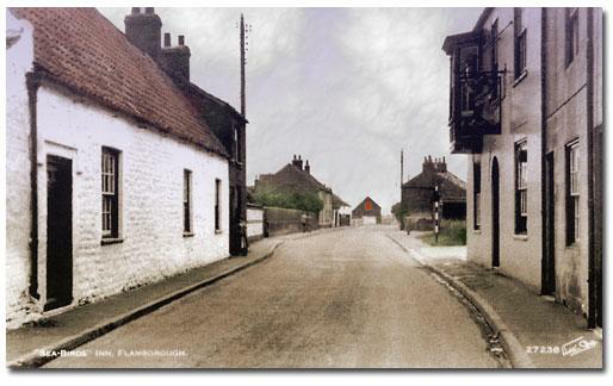 Flamborough was recorded as "merely a fishing village" with a "very ancient station, formerly of some note". Population at the time was 917, half of which constituted the families of fishermen. Occupations included eleven farmers, two blacksmiths, two butchers, two grocers, seven carpenters, four shoemakers, three tailors, a stone mason & flour dealer, a bacon & flour dealer, a weaver, a corn miller, a straw hat manufacturer, and the landlords of The Sloop, The Board, and The Dog and Duck public houses. Also listed was a schoolmaster and a gentlewoman. Four carriers operated in the village, destinations being Hull and York twice a week, and Bridlington, daily. With St Oswald's Church was a Methodist and a Primitive Methodist chapel. Originally a medieval fortified manor house founded by Constable family, Marmaduke Constable added a chalk pele tower and curtain wall to the earlier clay rampart and ditch in around 1351 to 1352 when he was granted a license to crenellate. Other than the surrounding earthworks, only three walls of the lower part of the tower remain. (Compare to the Edwardian postcard below). 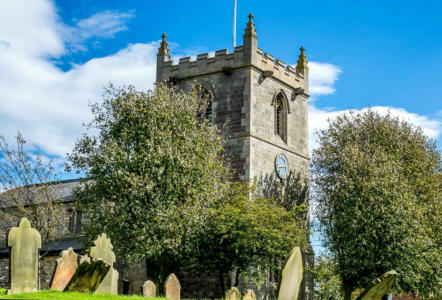 Flamborough Parish Church (St Oswald's) is situated a few hundred yards from the Manor House. The Tower dates from 1897, but parts of the Church are much older and the chancel arch is Norman. The main feature is a rood screen, described as "one of the most complete in the Riding, even though much is renewed." Flamborough is a village and civil parish in the East Riding of Yorkshire, England. 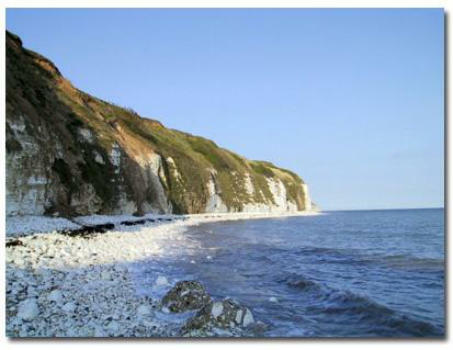 It is situated approximately 4 miles (6 km) north-east of Bridlington town centre on the prominent coastal feature of Flamborough Head. The most prominent man-made feature of the area is Flamborough lighthouse. The headland extends into the North Sea by approximately 6 miles (10 km). To the north, the chalk cliffs stand at up to 400 feet (120 m) high. 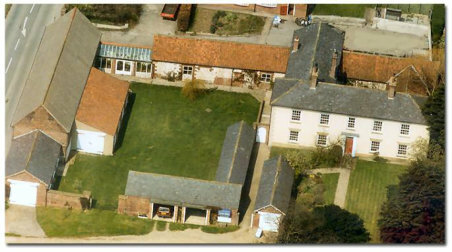 According to the 2011 UK Census, Flamborough parish had a population of 2,161, an increase on the 2001 UK Census figure of 2,121. The church of St Oswald stands in the village and was designated in 1966 by English Heritage as a Grade II* listed building. 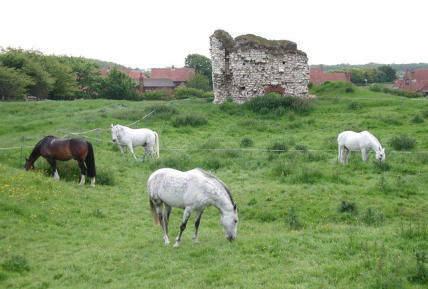 In the village are the fragmentary remains of Flamborough Castle, a medieval fortified manor house. In 1823 the village was a parish in the Wapentake of Dickering. 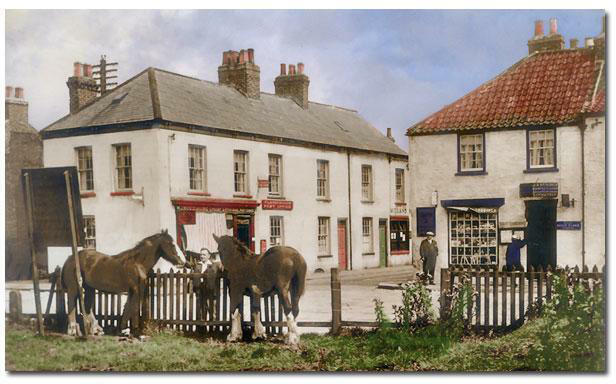 Flamborough was recorded as "merely a fishing village" with a "very ancient station, formerly of some note". Population at the time was 917, half of which constituted the families of fishermen. Occupations included eleven farmers, two blacksmiths, two butchers, two grocers, seven carpenters, four shoemakers, three tailors, a stone mason & flour dealer, a bacon & flour dealer, a weaver, a corn miller, a straw hat manufacturer, and the landlords of The Sloop, The Board, and The Dog and Duck public houses. Also listed was a schoolmaster and a gentlewoman. Four carriers operated in the village, destinations being Hull and York twice a week, and Bridlington, daily. With St Oswald's Church was a Methodist and a Primitive Methodist chapel. 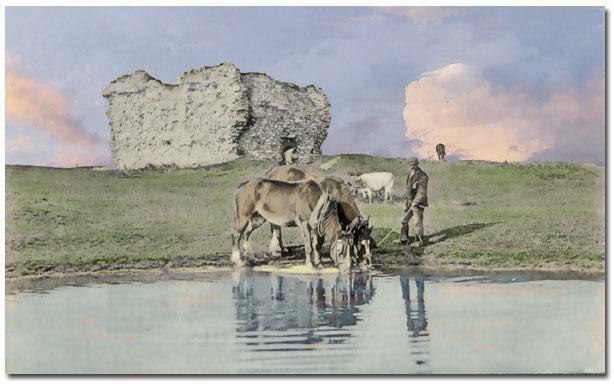 Originally a medieval fortified manor house founded by Constable family, Marmaduke Constable added a chalk pele tower and curtain wall to the earlier clay rampart and ditch in around 1351 to 1352 when he was granted a license to crenellate. Other than the surrounding earthworks, only three walls of the lower part of the tower remain.